The Dynomax Super Turbo Muffler Cat-Black Dual Exhaust System has a sleek stainless steel look and a patented flow director design channels exhaust flow and eliminates turbulence. The large internal flow tubes improve exhaust flow and reduce backpressure. Each muffler uses fiberglass matting technology to absorb unwanted interior resonance while maintaining a mellow performance tone. All Dynomax Performance Exhaust Systems bolt on for easy installation. Your vehicle’s complete exhaust can be quickly and easily customized with an emissions-legal premium performance system from Dynomax. The “Pure Unadulterated POWER” of DynoMax Super Turbo™ mufflers are backed by a Limited Lifetime Warranty and exclusive 90-Day Performance & Sound Guarantee. The Dynomax Super Turbo Muffler Cat-Black Dual Exhaust System is the right one for you if you want a great sound and look for a great price. You’ll want to purchase some exhaust clamps because the ones provided don’t tighten enough and high heat paint to prevent rusting later down the road. The chrome tips make this muffle visually appealing and sleek. 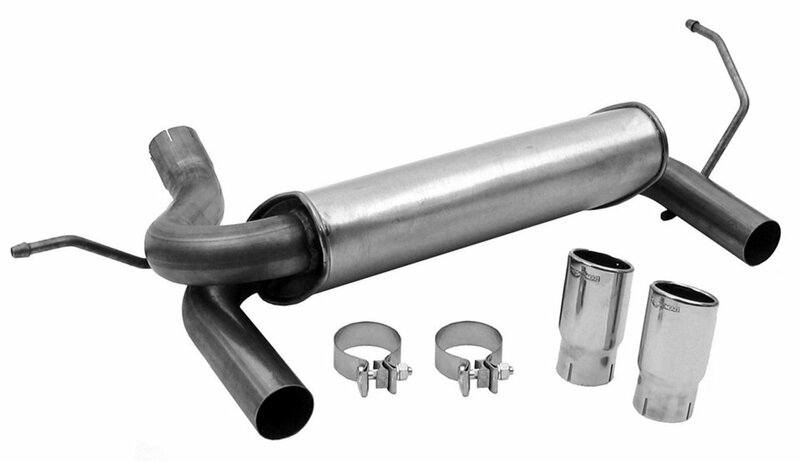 This exhaust system will give you a great look for a great price.